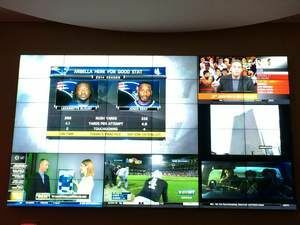 Installation of Boston's largest indoor bar or restaurant video wall is complete at Champions sports bar at Boston Marriott Copley Place, just in time for the NFL playoffs. Guests at the Boston Back Bay restaurant can now catch the games on an LED-backlit ultra-narrow bezel, professional-grade large screen display, that measures 11.5-feet high by 20-feet wide, and projects an image, or sets of images, over a span of 230 square feet. The NECX464UN display is built with a total of 36 46-inch LCD TVs in a 6x6 format, which offers ideal aspect ratio. Measured diagonally, the video wall is equivalent to a 276-inch (or a 23-foot) television. A single image can be displayed across the full display, or the display can be divided into four, five or six images shown simultaneously. Advanced technologies of this model include direct LED backlighting for improved uniformity, full high-definition resolution (1920 x 1080) and a 5.7mm distance bezel width. "We're thrilled with the new video wall, and the viewing experience it provides," said Director of Food & Beverage Jack Rutigliano. "Our local Champions regulars, as well as our hotel guests from around the world, are absolutely floored by this picture quality."